Removing introduced predators might not provide greater protection of nesting birds in Australia's temperate forests and woodlands, according to a new University of Queensland study. UQ School of Biological Sciences researcher Graham Fulton's review of 300 scientific papers on nest predation has found that getting rid of medium-sized predators might actually increase attacks from smaller predators. "In Australia, the introduction of foxes and cats, along with the reduction in dingo numbers is thought to have adversely impacted a range of smaller animals," he said. Mr Fulton said areas where foxes were baited showed increased nesting success, but controlling fox numbers could increase the number of cats, which also target birds. In turn, controlling cat numbers could empower smaller predators such as black rats or mice. "But it's not only predators which are to blame, humans are too," he said. "Birds such as currawongs, grey butcherbirds, Australian magpies and crows have increased their range and numbers as a result of the clearing of forest and woodlands. 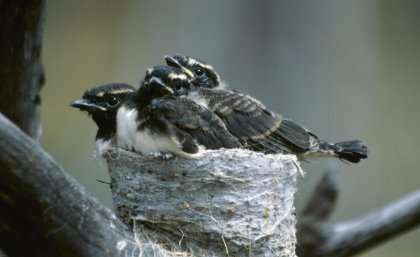 "These same birds are known predators of nestlings and eggs." He said more research was needed to improve the understanding of interactions between birds, their predators, and their habitats.